Drafted: Declared Hardship for the 1975 NBA Draft but withdrew... 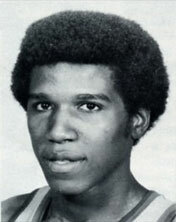 Selected by the Buffalo Braves in the first round (6th pick overall) of 1976 NBA Draft. First heard about AD when he was a 15-year old 6-3 215 pounder at DeMatha. He was no skywalker, but effectively used power, patience, timing, fakery, and footwork to fill it up. I always thought he was more like 6-4, making his college and pro effectiveness even more amazing. Just check out the FG and FT percentages on this guy. It was a treat just to watch him post guys up and crush them.